Monday was bright, sunny, and unseasonably warm — a perfect day to romp around in a prairie. My friend Aunita Erskine took me on a tour of Shanghai Prairie in Ann Arbor near St. Joe's Hospital and Washtenaw Community College. 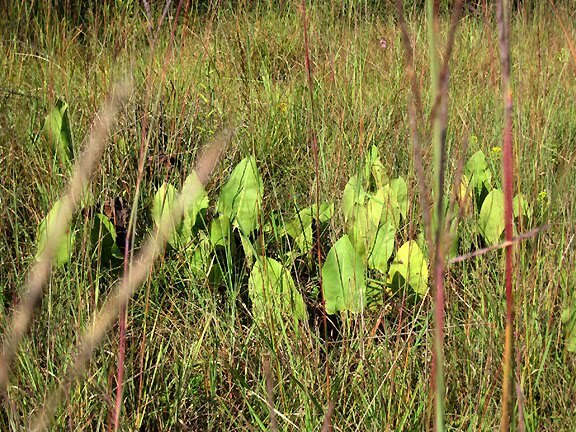 She has been spearheading a restoration effort of this prairie for several years. Volunteers have been removing invasive species like buckthorn and autumn olive, and building boardwalks over wet areas. 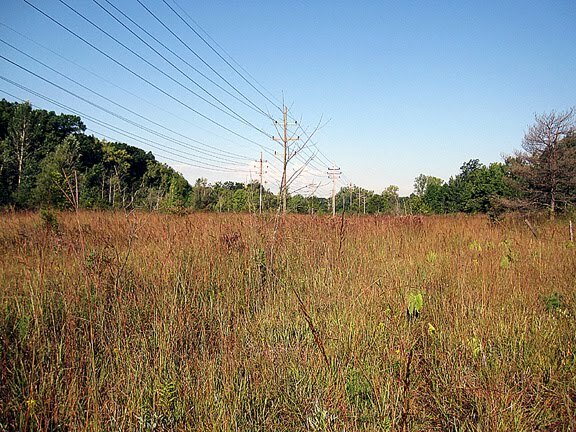 The prairie covers about 35 acres between railroad tracks and the bend in the Huron River. 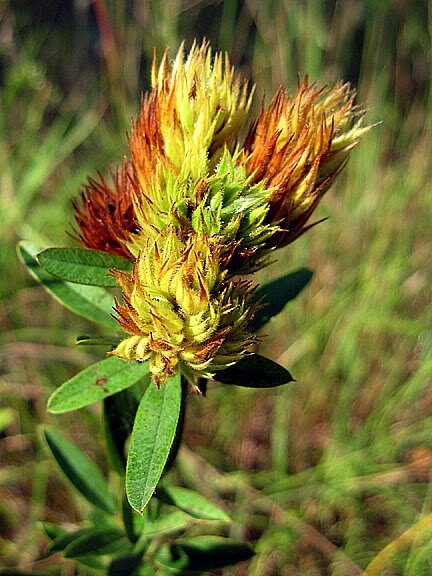 It's considered a disturbed prairie remnant, with part dry to mesic soil conditions. The wetter part of the ecosystem is a prairie fen. The prairie is in an area formerly inhabited by the Potawatomi, who called the area the Burnt River District. They regularly burned the area to create open spaces for the animals they hunted to graze. After the federal government bought the land, it was strip-mined for gravel. After that project was abandoned, vegetation returned, but many non-native and aggressive trees and shrubs filled in the space, outcompeting the grasses and prairie flowers. Later, sparks from the railway started little fires that killed the trees, and prairie plants again started to take a foothold. Everything growing the the prairie today was in the prairie hundreds of years ago. Nothing has been reintroduced. Many prairie plants also make great garden plants.You can integrate native plants into your existing garden or create a new bed just for them. 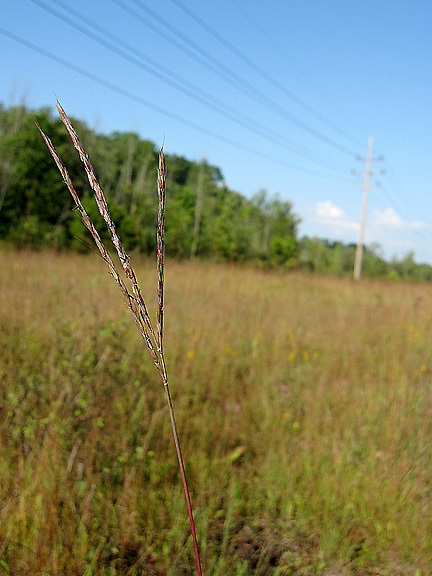 Big bluestem grass (Andropogon gerardii) is sometimes called turkey foot. It reaches about 8 feet, prefers full sun, and does well in most soil conditions, except sand. It gets red in fall and is named for its green-blue color in spring. The seed head gets tiny yellow flowers which are quite striking in the fall landscape. 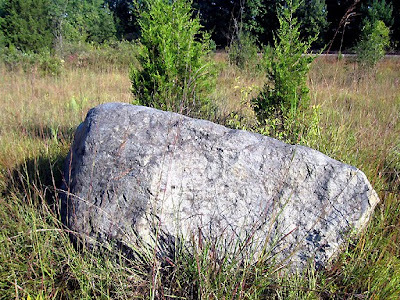 The prairie has several glacial erratics of varying sizes, which were washed in with the melting glaciers. Michigan is, by the way, the only state that was 100% covered in glaciers. It also means our soils are very random, from sand to clay to gravel in very short distances, sometimes in one yard. Little bluestem grass (Schizachyrium scoparium) gets about 3 feet tall and is ideal for the home garden. It gets gorgeous reddish fall color, but is named for its green-blue color in spring. It prefers full sun, and can deal with most soils. It's not wild about clay, but it does OK in my very clay-y soil. 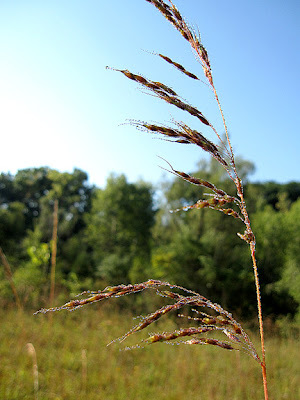 Indian grass (Sorghastrum nutans) looked so gorgeous covered in dew and swaying slightly in the breeze. It can reach 8 feet, but I've generally seen it top out at 6. Later in fall, its foliage turns dark orange/purpley. It is great for the home garden because it grows well in full sun to shade, and it can handle dry ot moist soil conditions. Prairie dock (Silphium terebinthinaceum) is eaten by dear in the prairie and only the leaves remain. It normally gets 2 to 3-inch yellow flowers on very tall (up to 8 feet) stalks. It needs full sun and can handle moist to dry soil conditions. Give it a bit of space, as the leaves are huge. 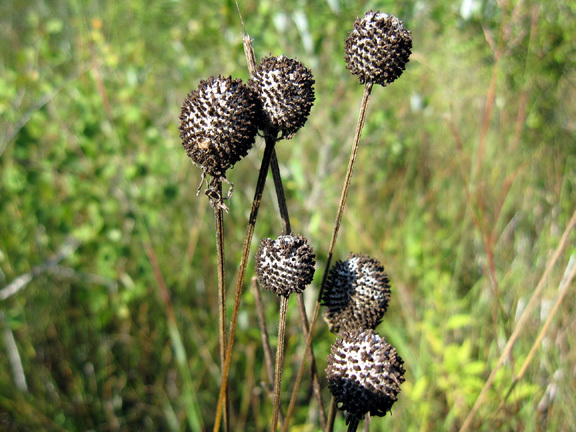 There's just something about these gray-headed coneflower (Ratibida pinnata) seed heads! The plant gets about 4 feet tall, has yellow flowers with brown centers, prefers full sun, and likes most soil conditions, except sand. My absolute favorite things in the entire prairie were these gorgeous spent flowers of round-headed bush clover (Lespedeza capitata). It gets about 4 feet tall and prefers full sun, and mesic (average moisture) to dry soil conditions. The bloom is white. 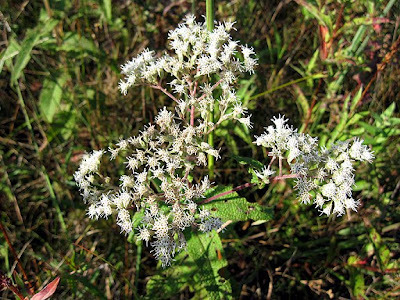 Boneset (Eupatorium perfoliatum) gets about 3 feet tall and is a nice companion plant to Joe Pye weed. It attracts bees and butterflies, can handle full to part sun, and prefers moist soil. The leaves were used to treat dengue fever. Heath aster (Symphyotrichum ericoides) is just starting to bloom. 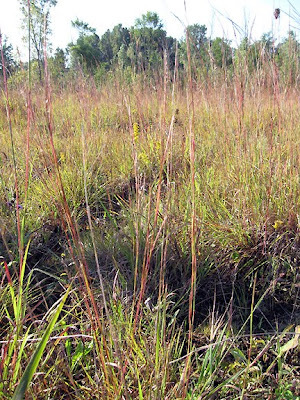 It's a wetland indicator species (meaning if you see one in the wild, it means you're in a wetland ecosystem) that gets about 2 feet tall and can also tolerate drier soils. It is resistant to deer browsing. 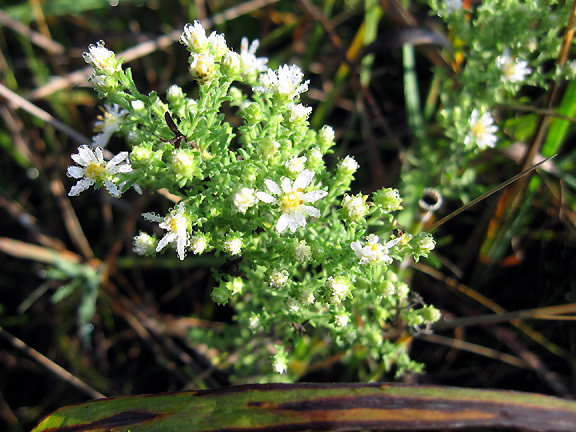 Native Americans used heath asters to bind the structure of sweat lodges and on hot rocks to create herbal steam. 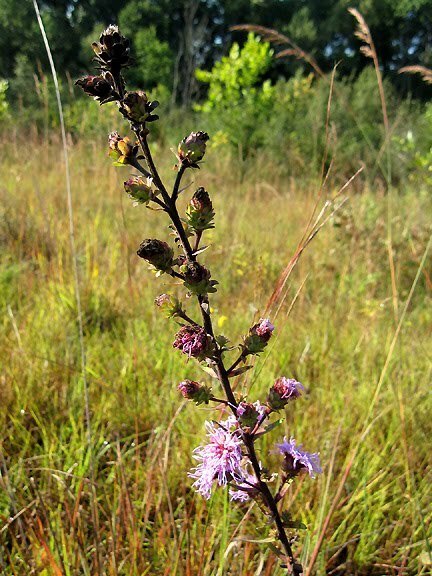 This plant is threatened in Tennessee. 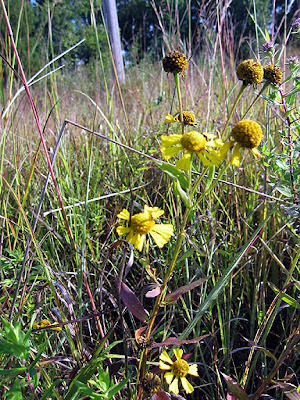 Sneezeweed or Helen's flower (Helenium autumnale) is one of my favorite fall flowers. Cultivars are available in burgundy ('Ruby Tuesday'), orange ('Orange Beauty'), and orange and yellow ('Mardi Gras'), but I also love the native yellow flowers. It grows to 4-5 feet tall and prefers full sun and moist soil; it flowers just as well in drier soils, but won't get as tall. Incidentally, it's called sneezeweed not because it causes allergies, but because Native Americans used it as snuff. I can tell you're getting tired, so we'll break up our jaunt. Next time I'll show more prairie flowers, including a ladies' tresses orchid, as well as Virginia snakeroot, a threatened species growing in the nearby woodland. The turkey grass sounds impressive. I love bush clover! All your picks here I have, and all grow so very very well no matter what you throw at them--except gas and matches. Toller Bericht! Als ich das erste Foto sah, dachte ich, da wächst wohl nicht gerade viel. Aber Du hast mich mit Deinen Fotos vom Gegenteil überzeugt. Ein genauer Blick lohnt sich halt immer. Reminds me of our walk through the prairie at Morton Arboretum a couple of years ago. Prairies are so pretty this time of year. Love the light in your photos Monica. Not tired at all, Monica! I so enjoy visiting prairie areas and I've learned to identify many of the species, but there are so many I still can't i.d. Thanks for such an interesting and informative tour, especially all the grasses, which I have trouble telling apart. When you say nothing has been reintroduced, do you mean all these plants are growing voluntarily? That's pretty amazing. Looking forward to the next installment on the prairie! In these blog there are so many things which is really very cool and fantastic these all are very excellent i like it so much these all things are great to know about it. Monica great post very informative!I am seeking out varieties of grasses for my woodland garden..great suggestions here..I'm now living close to Michigan..I'm close to Lake Huron..I shop on I-59 frequently. What an achievement and to think nothing reintroduced. Very impressive. Monica! Thanks for re-connecting! We should meet for lunch on M-59 area one day before the snow flys!Great shopping on that street!Lakeside I frequent! It was fun seeing some of the flowers I planted blooming in a real prairie. I almost got that tall yellow blooming plant that I can't think of the name of now, but decided I may not have room for it. Beautiful pictures, looks like my lawn! Seedheads are a beautiful part of God's creation, and half inch blades of grass don't do a thing for me.